John Durant remembers precisely when and where his scientific career veered from traditional academy into the world of community science outreach. Call it the invitation that rolled downhill. 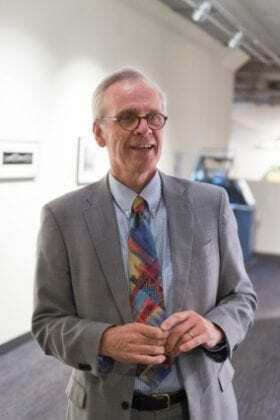 Durant is director of the Massachusetts Institute of Technology (MIT) Museum, where he began in 2005 after decades of leadership at major British science museums. This summer, Durant joined the scientific advisory board of the Morgridge Institute for Research, where he will give guidance to an outreach program that attracts more than 30,000 people annually to the Discovery Building. He is also widely recognized as the leading force behind the science festival renaissance in the United States, which has grown from two festivals in 2005 to more than 50 today. In fact, at some point in fall of 2016, Durant reports that American science festivals will have hit the milestone of two million participants. This passion for “explaining science to non-scientists” has its roots in Durant’s early-1970s graduate student years at the University of Cambridge, where he studied history of science. The department received a written request for someone to teach a 10-week evening class in a small village about an hour from Cambridge. The subject matter would be Charles Darwin and evolutionary history. As a scholar of evolutionary history, Durant was intrigued by the possibilities. So for the following 10 Wednesdays, he took a bus to the town and met about 20 adult students at the village hall. They were mostly farmers and laborers, with little to no higher education background, but a strong curiosity about the topic. After the lecture, a farmer in his 50s came up to thank Durant. “He told me it was the first time he understood why the moon changes shape over the course of a lunar month.” This was coming from a man who spent a great deal of his life outdoors, no doubt witnessing hundreds of lunar cycles. Today, the science festival movement demonstrates that scientific engagement is taking on a decidedly populist form. The efforts started in places like Cambridge — home to MIT and Harvard University — Philadelphia and the Bay Area, big urban centers with scientific critical mass and healthy budgets. But the second wave, being supported by the Science Festival Alliance headquartered at MIT, is happening in smaller geographic areas, and many have statewide aspirations. The Wisconsin Science Festival (Oct. 20-23, 2016), now in its sixth year, is a nice hybrid of the two approaches. UW-Madison started as the primary hub of the festival but it has truly grown statewide in scope, with more than 60 programs last year offered outside of UW-Madison, from Bayfield to Baraboo.